Product DetailsFirst released in 1996, the long-running video game series jumps to vinyl with Funko Pop Persona 5. The RPG (role-playing game) is a spinoff of the Megami Tensei franchise. Featuring the sixth major installment, Funko Pop Persona 5 highlights students battling evil in Tokyo. The Pop! Games vinyl lineup includes the Joker in his masked form. The chase variant is unmasked and randomly replaces the main figure. Buy the Persona 5 game on Amazon. Ann Takamaki, a.k.a. Panther, is dressed in her red catsuit with a large whip in hand. The model's flowing blonde hair is visible on either side of her mask. Ryuji Sakamoto goes by the name Skull, which is made abundantly clear when you see his metal mask. He also wields a pipe. In addition, there is Morgana, or Mona, who acts as a mentor to the group and also happens to be a cat. 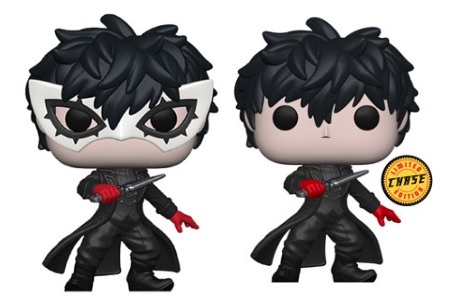 Let us know if you see any more Funko Pop Persona 5 figures. Buy figures from Entertainment Earth.